I was thinking tonight. Besides the historical significance and the fact that it's just cool that we can make something size float, I think it's because they are so intresting. If you add crew and PE and other AM, you can portray all kinds of situations. They are like model railroad layouts or the anual Christmas tree with all those little nicknack ornaments that have been collected for years, there's just so much to look at. Done right, one could look at a model ship for several minutes and see all kinds of scenes going on. I love planes mind you, armor meh, but a well thought out ship with lots going on, that's like looking at a miniature city. I would not say I have a favorite amongst the modeling genre. But, I really do like ships. 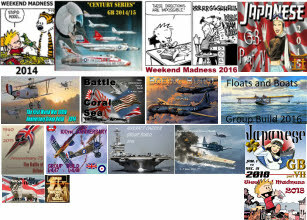 The few modeling competitions I've been to, I find myself oogling over the ships the most. And I don't mean the flat top diva's, I mean the battle friggin wagons! I love a big hunk of metal floating in the water with big guns! One of these days, I will take a trip to see the USS Missouri, or USS North Carolina. Yeah, Steve, I understand why you like ships! I would imagine a ship model would be something you could look at once, then come back to look at it again and again and find details you didn’t see before. I need to get over my intimidation of building ships to join the ranks! There is something about a ship that gives me a sense of "Man, did I do that?" which other subjects don't offer to me. What seemed to me months ago a mass of lines and threads, actually turns into a organized mechnism where each line has a purpose and will actually work. I also am intrigued with the artistic nature of ships, whether its an Elizibethan Gallon, a pre-drednaught, or a dazzle painted battleship, they all seem to offer some sort of value to the eye. 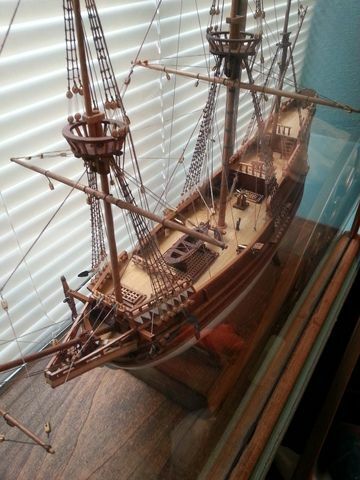 I built a big Mayflower years ago, spent night after night for months carving, sanding, rigging and hand making the case. Sometimes I will just sit there and look at it again, and not really remembering the work that went into it. I'm fascinated at looking at it and all the little intricacies. When I finally complete the 1/98 scale HMS Victory, it will amaze me for years. Part of it might also be that you’re so crazy talented at modeling water. I only dabble in ships myself, but I think one can achieve that “a lot going on” in most any genre. With armor, autos, aircraft, sci fi, or real space, a lot can be added to make a story, or multiple stories, be it a small vignette, or full diorama with only a single subject piece. WWI & WWII planes are my favorite with sailing ships coming in second. There has always been at least one or two ships being built on the bench while waiting for glue/paint to dry on something else. Just finished the Emma C Berry for the 1/2 wall in the living room. The Scottish Maid still sits on the mantel. Both were picked out by my wife for me to build. The next is being rigged now. It's the U.S.S. Kearsarge. That's going to be in the living room also. Hope the pics are OK. Still getting used to transfering photos from the wifes phone and working with Google photos. After the Kearsarge is finished, I have to build a Gato sub for one of my cousins whose father was a submariner in WWII. Started it about 2 years ago. Opened up all the limber holes on one side so far and some other minor work. Little by little I'll get it done with all the other cleaning and fixing work from the museum. Steve, I agree. Though I am not a ship builder, I want to be. I dabbled in it and I will do so again... God willing. There is something about ships that moves my spirit. Especially, masted ships. A well done ship is something I can admire for hours. Dang Jim, some nice looking stuff there. This isn't the best picture of my Mayflower but It's all I could find. I first became interested in ships reading the Hornblower novels. I built a destroyer when I was about in third grade, and then a revenue cutter when I was in eigth grade. Both were wood- these were the before-plastic era. Anyway, the revenue cutter was a topsail schooner and had a fair amount of rigging, including ratlines, so I had an early introduction to rigging. 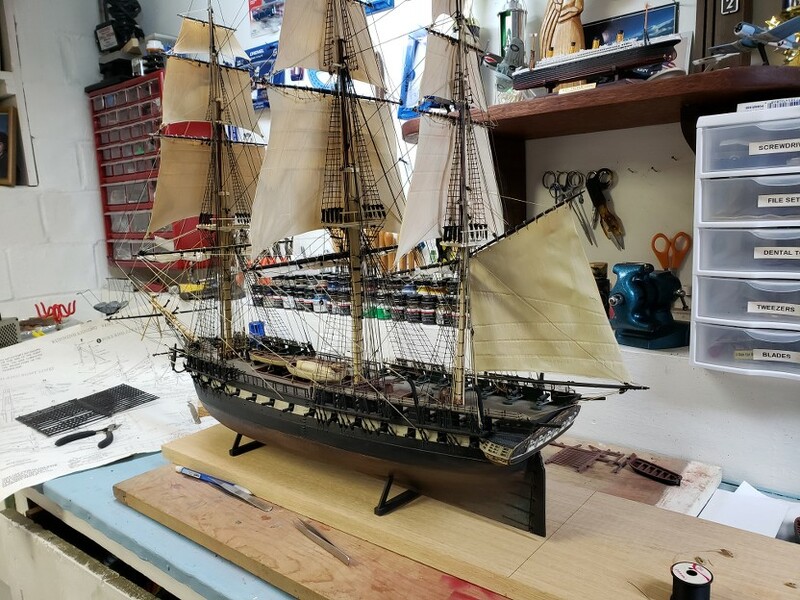 While I built airplanes and cars as well as ships, my ability to tackle rigging so many years ago gave me a skill that has produced some nice models and kudos, and I think that reinforces my willingness to tackle sailing ship models. I must say, however, the big 1:00 scale heller Soleil Royal is challenging me- I have been building that thing for almost twenty years off and on. Every thing is done now except rigging, and the rigging on that thing never ends! Steve, your Mayflower looks awesome. It’s funny because the Mayflower is what I want to build most. I have a plastic version to build but I have been toying with popping for a wood kit. And yes, nice work Jim. I started out in modelling way back when. In the late sixties I built them all, WW2 warships, my dad was Navy. I also did the small USS Constitution and also the 1/96, I think, one. I have loads of fun rigging it. I also did the USS Kearsage. You can't find that one any more, I gave it away to one of my brothers old girlfreinds decades ago. I love ships. Unfortunately, they can really take up room in apatments. 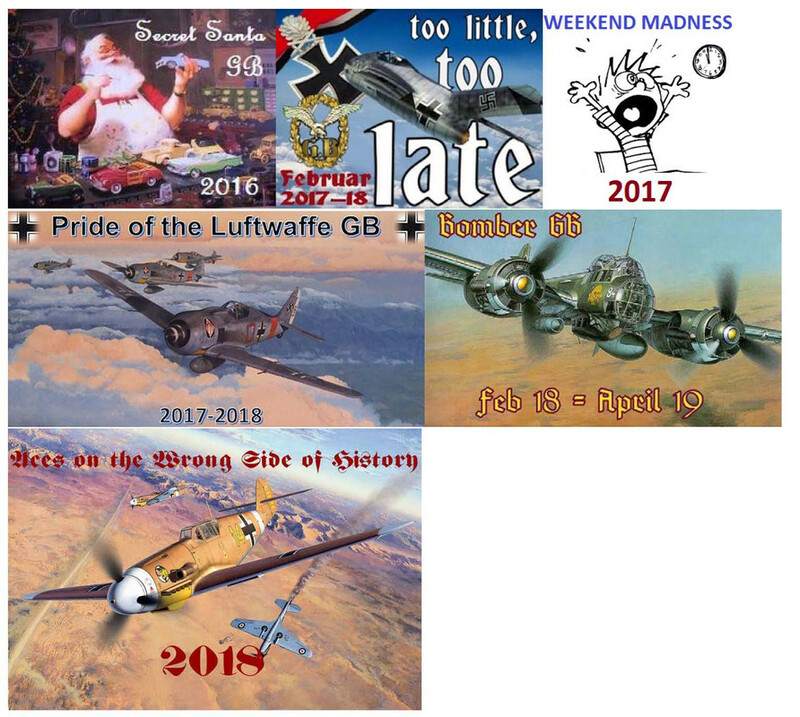 Tanks and aircraft, not so bad. Now that I've been in a house for the last 20 years, it's not so bad. Recently I've been building a few. I still love Ships of all types. Thanks MC! My uncles started me building ships when I was 6. I think the best one I ever built was the Gorch Fock. Built it back in the mid '80s. Kept it for about 15 years then gave it to my then boss for her office as I was running out of room in the workroom back then. As of a couple of years ago, a new boss has that office but the ship is still there.